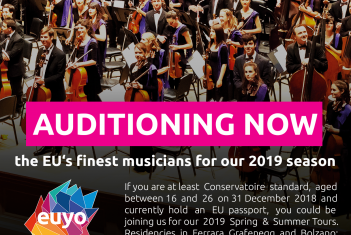 All applicants for the 2019 Orchestra must be aged between 16 and 26 inclusive on 31 December 2018 and hold passports from one of the 28 European Union member countries. Precise rules and regulations are available here. Monday, 5.11 pre-auditions for strings at 11.00 at the Organ hall (A-404) and for the wind, brass and percussion at 14.30 in the Chamber hall (C-405). NB! At the pre-auditions you'll be asked to play the orchestral extracts only and it is meant for preparing the applicants to better perform the orchestral extracts under the guidance of Arvo Leibur and Peeter Sarapuu. The excerpts should be prepared, but not expected to be performed flawlessly. Friday, 16.11 final audition at 10.00 in the Organ hall (A-404). Candidates will be asked to play a prepared piece of their own choosing (eg a movement from a concerto, sonata etc) and a selection of orchestral extracts. NB! Percussionists will be asked to play a selection of prepared orchestral extracts only (no piece). NBB! If the piece of your own choosing involves piano accompaniment, you are obliged to bring your accompanist. With no accompanist you will not allowed to audition. All the candidates are requested to fill in the application and send it by Friday, 2 November latest to kai@ema.edu.ee. The European Union Youth Orchestra, founded in 1976, is by now one of the world's pre-eminent symphony orchestras that has worked with many of the world’s greatest musicians including Daniel Barenboim, Leonard Bernstein, Herbert von Karajan, Mstislav Rostropovich and particularly its three Music Directors and current Chief Conductor: Founding Music Director Claudio Abbado, former Music Director Vladimir Ashkenazy, former Music Director and current Conductor Laureate Bernard Haitink, and Chief Conductor Vasily Petrenko.The spring and summer tours 2019 will take place in the EUYO residencies in Ferrara, Grafenegg and Bolzano followed by concert tours to Austria, Germany, Italy, Luxembourg, The Netherlands, UK and Oman. More precise info is available here.